Dimitar is a musician with extensive experience in performance, composition, teaching and sound production. He holds two degrees from Goldsmiths, University of London. Bachelors in Jazz and Popular Music Studies, specialising in performance and composition, and Masters in Creative Practice, focusing on the depths of musical creativity, including studio work, writing music for various forms of media and theater, as well as psychology and philosophies of music. 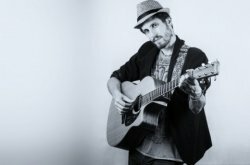 He has been teaching individual and group classes in guitar and music technology since 2007 and has built exceptional means of communicating knowledge effectively, allowing the students to learn what they wish, whilst attaining a solid foundation of what they need. Playing guitar is about having fun and enjoying your time that you spend improving. Here is a little break down of what you could be learning, knowing that each lesson will be different. It is divided into physical and mental aspects of learning that could be useful to a musician, yet each finds their own way, so we will concentrate on finding your sound and musical voice and what makes music pleasurable for you, and then improve on all the rest to find your best. - Posture - maintain relaxation, whilst maximising the output of your body's capabilities. - Technique - develop skills for both acoustic and electric guitar, anything that you can think of, which has been played by men. - Practicing regiments - for attaining maximum results in the shortest times. - In-depth use of scales and chords - interval thinking and beginner to advanced concepts of music theory. - Improvisation - you will be shown ways to connect the contents of your mind with what comes out of your hands, which can allow free flow in music. - Songs - you can be shown songs of any style and genre, which will be broken down into segments, in order to grasp the underlying concepts of structure and form. - Performance skills and tricks - learning how to build an exciting performance. - Ear training - necessary for the heightening of music appreciation. - Reading skills - understanding theory and ability to read and write music sheets and tabs. - Retaining positivity and self-control in any situation. - Increasing of focus and concentration. - Keeping a calm mind and ability to diminish stress. - Clear outlook and mindset on goals and tasks at hand. - Listening skills, as a foundation of a good sonic communication. - Enhanced enjoyment through continuous self awareness. 4. Beginner to expert Ableton Live concepts and tricks. 7. Understanding technology, as means of extension of your mind. Learning should always be pleasurable and I prefer teaching people who would love to learn. If you do, get in touch to begin a wonderful music journey, where you can go as far as you wish. Lessons will take place either at Dimi's home studio In Shoreditch or at a location set by the student, for an extra fare if long commuting is required. DimitarFrom Yoanna (5/5): Dimitar welcomed me, my 5 year old son and 3-year old daughter to his studio. He was very accommodating and patient with us, he allowed us to marvel at all the beautiful instruments he had there.The lesson was very interesting for mu son. At the end Dimi performed "Hit the road Jack" for us, which was well admired by the children and they enthusiastically improvised playing and singing on their own when back home.